EnviroLink Forum • View topic - Oh, my. After 15 years without substantial global warming, the climate-crisis crowd is in trouble. For a long time they simply ignored the warming hiatus. Then, about a month ago, The Economist acknowledged the problem with a thoughtful article on the discrepancy between “consensus” climate models and observed surface temperatures. This was followed by articles in the New York Times, the Washington Post, and most recently, The New Republic. All of these pieces sought to minimize the challenge posed to policies like carbon taxes and emissions caps by the increasingly apparent flaws and uncertainties in climate science. If the first phase was denial and the second minimization, we may now be entering phase three: outright crisis for policy prescriptions aimed at global warming. Once again, The Economist leads the way with a powerful critique of The New Republic piece, and of the tendency of mainstream acknowledgments of the warming hiatus to pretend that carbon taxes and emissions caps aren’t called into question by new facts on the ground. I won’t give excerpts here, because the blog post at The Economist deserves to be read in full. All I can add is that, if this is how things are going one month into the new frankness about the warming hiatus, the climate-crisis crowd has a very big problem on its hands. Post subject: Re: Oh, my. Last edited by Johhny Electriglide on Sat Jun 22, 2013 1:12 pm, edited 1 time in total. Wow, National Review, that's where I want to get my AGW information from. We need a study of the roots of the denialist unreality. It has reached flat earth proportions. 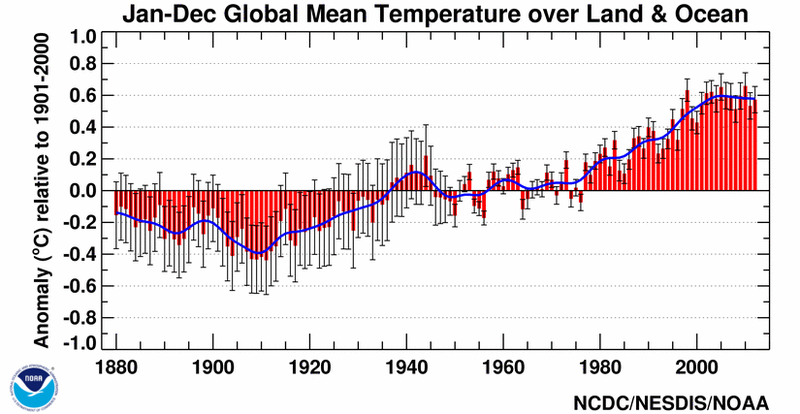 To make it simple, we have been measuring annual planetary temperatures since 1880. During two periods we reached temperature heights that weren't revisited for over 30 years. The last temperature heights were a tie, 2005 and 2010. If we don't breach that in 30 years come back and do your little dance. The graphs of our irregular but relentless temperature rise have been posted ad nauseum but perhaps in your strange denialist world it didn't register so here's a little help. I always get my science data from political and economic blogs, doesn;t everyone? That is where all of the real scientists post their data after all. The thought temperatures must continue to rise in direct relation to CO2 ignores so much of the science that it makes the presenter really useless for a reference. A Dingo noted the minimal period for climate reference is generally 30 years and using weather instead goes back to the previous point of the presenter making themselves useless as a reference. The problem is the blogger has an agenda which is unrelated to the pursuit of the truth and is not here to respond to the points overlooked.